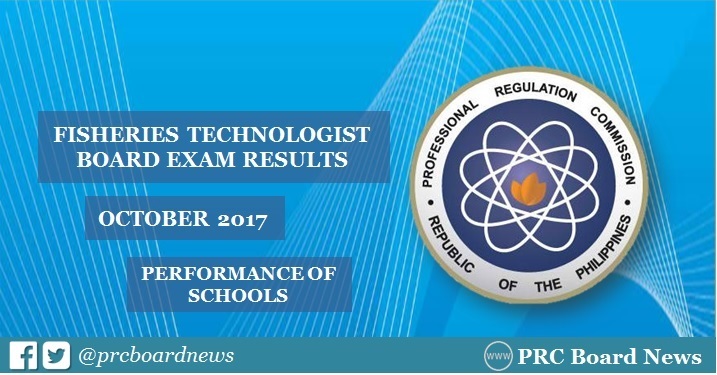 MANILA, Philippines - The Professional Regulation Commission (PRC) recognizes the top performing schools in the October 2017 Fisheries Technologist board exam. The result was released on Monday, November 6, 2017 or in 5 working days after the exam. PRC administered the Fisheries Technologist licensure exam in the cities of Manila, Baguio, Cagayan de Oro, Cebu, Davao, Iloilo, Legaspi, Lucena, Tacloban, Tuguegarao and Zamboanga on October 25 and 26, 2017. In the October 2016 Fisheries Technologist board exam, University of the Philippines Visayas (UPV) - Iloilo City was named as the lone top performing school with 97.01% or 65 out of 67 passed the exams. UPV-Iloilo City and Western Philippines University (WPU) - Puerto Princesa were the top schools in the October 2015 examinations for obtaining 94.87% and 91.30%, respectively. These useful reference will help you in marketing and more available sites. Keep posting like that post. Keep it up. From this site, we can take help to solve the room assignments. It will get the latest updated for assignments and exam also.we can check the result of the assignments and exams. In this site, http://www.sopwritingservice.net/our-sop-writing-services/phd-statement-of-purpose/ we can check the result of the topper schools and colleges.